En battant Myogiryu, le yokozuna Hakuho devient le premier lutteur à atteindre le kachi koshi. Le yokozuna Hakuho conserve son avance et garde la tête du peloton dimanche en atteignant le kachi koshi en premier à l’issue de cette huitième journée. Malgré un score parfait, le plus grand champion de l’histoire du sumo n’était pas sans faille sur le dohyô face à la ténacité du sekiwake Myogiryu. Après avoir conduit de force Myogiryu sur le rebord de l’anneau, Hakuho s’est précipité vers son adversaire. Le sekiwake a esquivé la charge mais en chancelant, il a perdu l’équilibre et est tombé hors du dohyô. 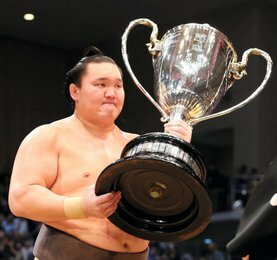 Hakuho semblait se diriger vers l’extérieur du cercle lui aussi mais a réussi à retrouver son équilibre juste à temps. Cette victoire permet à Hakuho de devancer d’un point ses cinq principaux concurrents qui le suivent avec un score de 7-1 comme le yokozuna Harumafuji ainsi que les ôzeki Kotoshogiku et Kisenosato. Harumafji a utilisé ses capacités d’attaquant en privilégiant un angle faible. 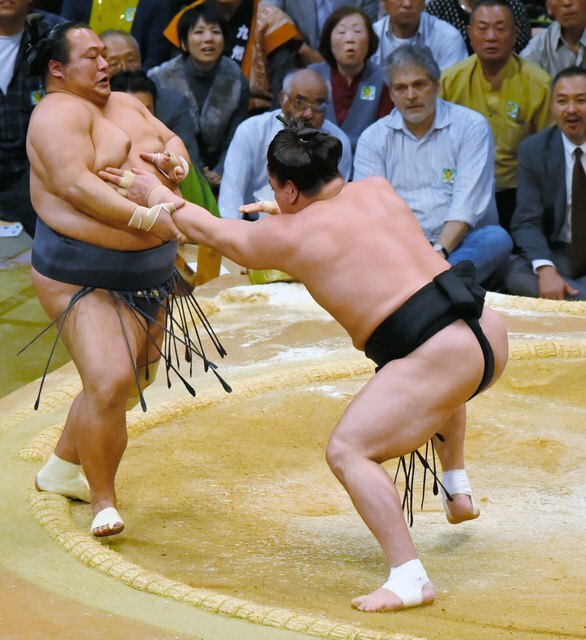 Le yokozuna a poussé le maegashira 3 Toyonoshima tout autour du cercle avant de le pousser vers une cinquième défaite. C’était la 35ème victoire de Harumafuji sur les 43 combats contre Toyonoshima. 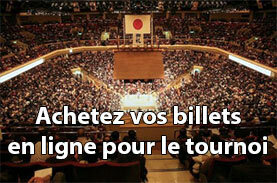 Kakuryu s’est agrippé au mawashi du komusubi Tochinoshin à l’aide de sa main gauche et s’est mit à balancer le lutteur géorgien dans tous les sens jusqu’à obtenir la victoire. Kotoshogiku a amélioré son résultat à 7-1 en forçant Osunaarashi vers la sortie. L’ôzeki n’a pas perdu son énergie tant dis que l’égyptien tentait en vain de le renverser. Avec beaucoup de détermination, Kotoshogiku a fini par repousser petit à petit son adversaire vers le bord du cercle avant de le sortir pour de bon. Kisenosato rejoint son camarade ôzeki après sa septième victoire contre Okinoumi. Ne totalisant que des défaites, Okinoumi est le premier lutteur à être make koshi. Dans le match entre ôzeki, le kadoban Goeido a profité de l’immobilité de Terunofuji pour s’imposer rapidement face au mongol. 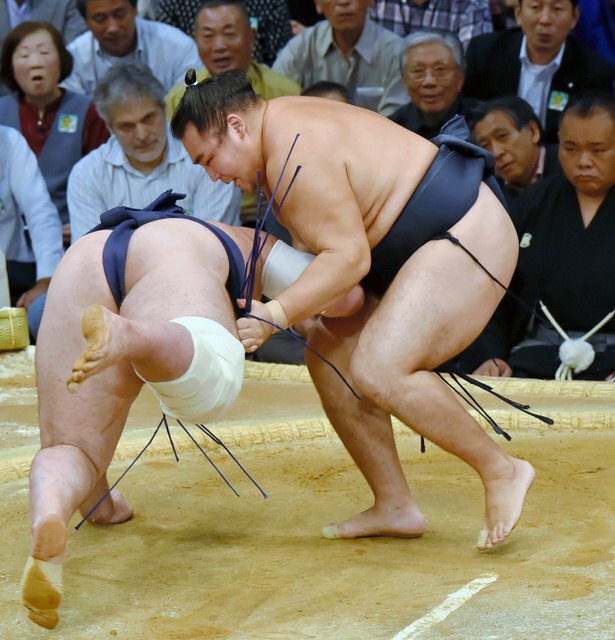 Terunofuji dont la jambe droite est entièrement bandée s’est précipité vers le côté pour esquiver la charge de son adversaire mais il a échoué dans sa tentative. Goeido ne s’est pas laissé surprendre en stoppant son élan puis a pivoté vers la gauche alors que Terunofuji était en équilibre sur une seule jambe. Le maegashira 4 Ikioi a chuté vers une seconde défaite décevante lors du tête-à-tête avec Tochiozan. Ikioi avait pourtant une opportunité de s’emparer de la victoire lors de la charge du sekiwake manqué mais Tochiozan s’est montré agile en retrouvant rapidement son équilibre. Plus loin dans la division, les maegashira Shohozan et Takayasu passent leur score à 7-1. Chiyootori qui était invaincu lors de ses cinq premiers combats avait perdu les deux suivants. Aujourd’hui, le petit frère de Chiyomaru a renoué avec le succès en battant le jeune Mitakeumi. 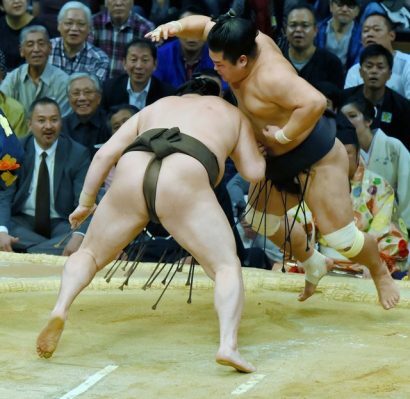 Yokozuna Hakuho remained one step ahead of the pack on Sunday, improving to 8-0 as the 15-day Kyushu Grand Sumo Tournament entered the home stretch. Although his record remained perfect, sumo’s greatest grand champion was anything but flawless in the ring against sekiwake Myogiryu (2-6), who came out with more than his share of tenacity and attitude. After finally forcing Myogiryu back to the edge of the ring, Hakuho lunged for his opponent. The sekiwake dodged the brunt of the blow, but teetered off balance and out of the ring. Hakuho, who appeared headed out of the ring, somehow managed to slam on the brakes and despite a wobble, stayed on the winning side of the straw. The victory left one win ahead of five wrestlers at Fukuoka Kokusai Center with 7-1 records, including rival yokozuna Harumafuji, and the ozeki duo of Kotoshogiku and Kisenosato. Harumafuji, the smallest wrestler in the makuuchi division, used his ability to attack opponents from a low angle. The yokozuna got under No. 3 maegashira Toyonoshima and shoved him around the ring before thrusting him out to his fifth loss. It was Harumafuji’s 35th career victory in 43 bouts against Toyonoshima. Yokozuna Kakuryu (6-2) latched onto the belt of komusubi Tochinoshin with his left hand and proceeded to swing the Georgian grappler around the ring. 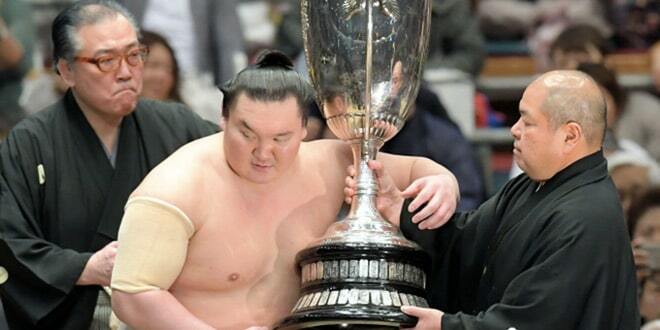 When the spin cycle stopped, Tochinoshin crashed to the sandy surface with five losses. 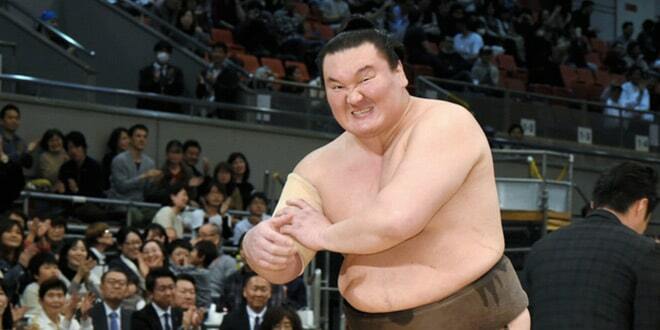 Kotoshogiku improved to 7-1 by forcing out Osunaarashi (2-6). The two fought to a draw on the tachiai, but Kotoshogiku bided his time and wasted no energy while the top-ranked Egyptian maegashira flailed in vain to topple him. Instead, the ozeki gradually pressed his man to the edge of the ring before finishing him off. 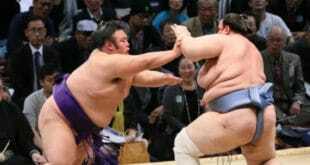 Kisenosato joined his fellow ozeki at 7-1 with an equally clinical win over winless No. 2 maegashira Okinoumi. 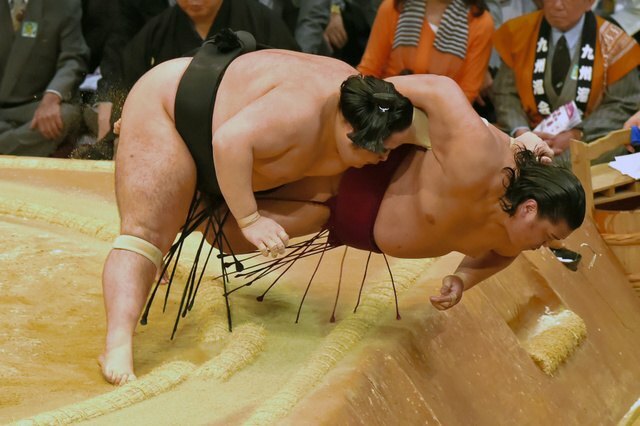 Kisenosato worked carefully from start to finish before shoving his opponent to the straw’s edge and bellying him out. 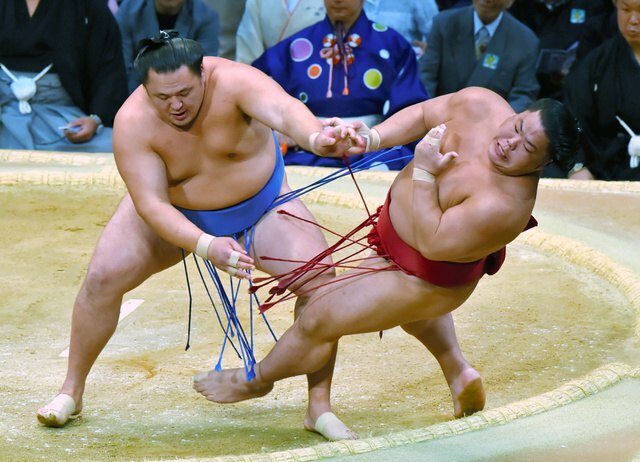 In a battle of out-of-form ozeki, relegation-threatened Goeido (5-3) took advantage of Terunofuji’s immobility to make quick work of his rival. Terunofuji (4-4), whose right leg is thoroughly taped, leaped to one side to dodge his opponent’s charge, but it proved futile. Goeido looked as if he saw it coming. Upon contact, he stopped in his tracks, pivoted to his left and with Terunofuji still balanced on one leg, easily forced him out of the ring. No. 4 maegashira Ikioi dropped from the ranks of wrestlers with one loss, suffering a disappointing defeat at the hands of sekiwake Tochiozan (4-4). Ikioi had a window of opportunity when the sekiwake’s charge missed his mark, but was unable to bundle the agile Tochiozan out. The two repeatedly crashed into each other, and each time Tochiozan regained his balance more quickly improved his position until he was able to grab Ikioi’s shoulder with both hands and swing him to the surface. Near the bottom of the makuuchi food chain, No. 12 maegashira Takayasu and No. 10 Shohozan both won to remain at 7-1. Takayasu finished off No. 11 Gagamaru (5-3) with an overarm throw, while Shohozan defeated No. 10 Sokokurai (5-3) using a pulling overarm throw.